On Friday, New York City mayor Bill de Blasio released the latest designs for the Union Square Tech Hub, a $250 million project that aims to “create a central convening point for technology training and networking” as the Big Apple tumbles into the increasingly digital future. 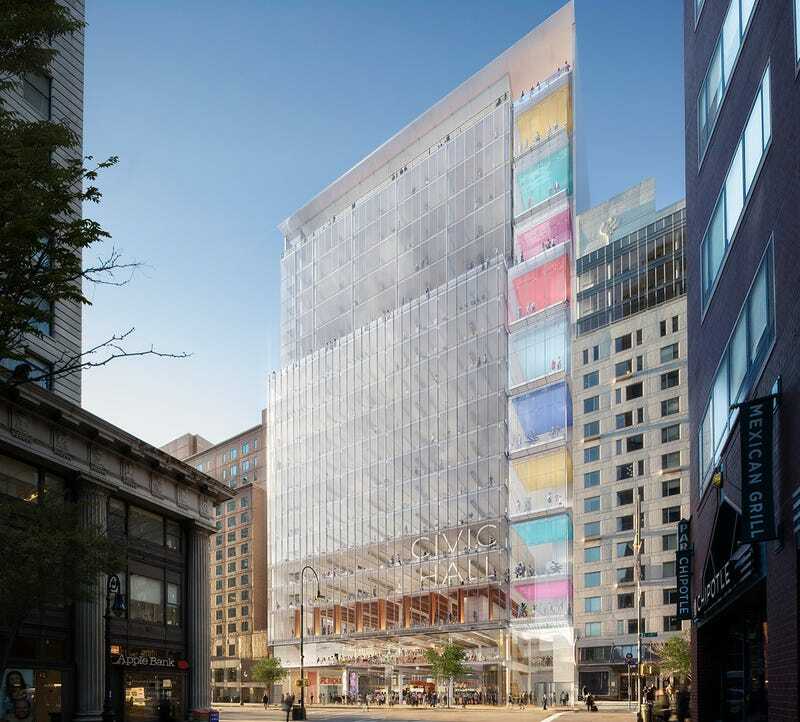 As evidenced in the designs released by the mayor’s office, 14th street’s new tech tower looks like what would happen if you asked Ikea to build a white-collar prison. This massive broken Rubik’s cube will be erected in the heart of New York City’s Union Square, which in recent years has become home to Best Buy, Whole Foods, Forever 21, and Sephora. The tech hub will be erected between NYU’s Palladium dorm (once home to a famous nightclub of the same name) and a Trader Joe’s. It will take the place of P.C. Richard & Son, a local family-owned TV and appliance chain that’s been in business for over 100 years, which will move into the basement of 14th @ Irving. The Union Square Tech Hub—its facade glistening in the light of dusk, like a spreadsheet about virgins—is a symbol of the direction that New York has been heading in for a long time. Announced by de Blasio in December, the “fluid space” for startups—which the city plans to break ground on in 2018—will also have a 36,500 square foot tech training center that “facilitates formal and informal learning, networking, collaboration, and real-time feedback about industry needs.” De Blasio wants New York City to be a beacon of innovation. “It’s about protecting democracy,” the mayor added, taking it way too far. He also called the hub “beautiful.” Yes, a “beautiful” void with sharp edges, a hollow maze of New York City’s sanitized cyber future.